Eat & Drink Newcastle History walks, Small Group City Walks, School Excursions, Corporate Events & Private Parties to suit you! Join one of our regular fun and informative tours of Newcastle. Our walking tours and local experiences are #1 Newcastle guided tours on TripAdvisor. From scavenger hunts to food & drink tours, our 5-star rated team experiences are professional and fun. We make it work for you! Book a fun & unique private tour, birthday, or special event. Our tours make the perfect gift! 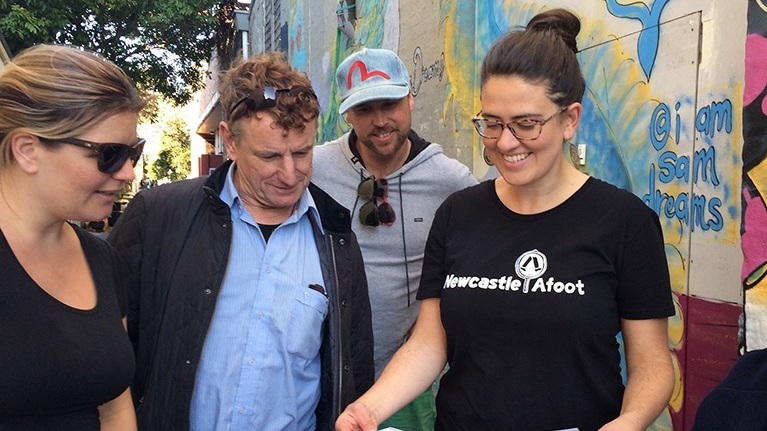 Newcastle Afoot provides small group walking tours and curated local experiences that aim to explore the diversity of our city's culture, old and new. Our tours and experiences are relaxed, informative and fun. Got a question about our tours and experiences? Get in touch with us, we are happy to talk through the best options to suit you!